!! OMG, how cute: Butterscotch !! 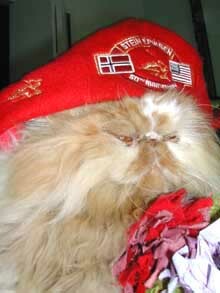 If you were to wade through all the conservative babble on of the “Mensa Barbie” blog, you would be rewarded with adorable photos of the author’s Persian cat, Butterscotch. Fortunately for you, I already did that painful work and present to you Butterscotch dressed as Osama bin Laden (above), and in two other costumes after the jump! 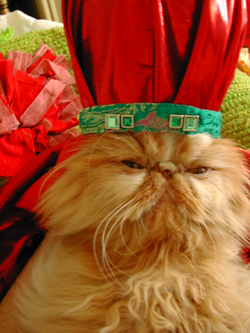 It’s Lunar New Year Butterscotch! 2 Comments on "OMG, how cute: Butterscotch"
That Cat needs some drug testing because it looks high as a kite.